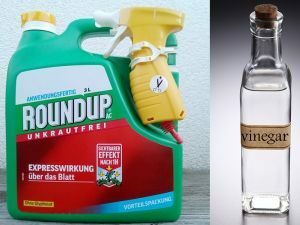 Roundup Made With Vinegar (Rather Than Glyphosate) Is Now Available in Europe! Author SimaPublished on May 23, 2017 October 27, 2017 Leave a comment on Roundup Made With Vinegar (Rather Than Glyphosate) Is Now Available in Europe! Roundup is a pesticide (a weed-killer or herbicide) containing the active ingredient glyphosate. It is a controversial herbicide that is the most heavily used pesticide in the world. And since the introduction of Roundup Ready crops that have been genetically modified to survive repeated Roundup applications, the use is only increasing on farms. Several posts (here, here, and here) have discussed research and controversies with Roundup, and the numerous health concerns (including that it is a "probable carcinogen"), as well as the residues that are in our food (and allowed to be there). But...I just read an article that said that a product called Roundup, but containing acetic acid instead of glyphosate, is now available at garden centers in Austria. Ordinary vinegar is 5% acetic acid. Huh?? Can that be? Yes, this product called Roundup AC is being manufactured by Scotts (the name is licensed from Monsanto), and it uses 10% acetic acid in place of glyphosate. Apparently Scotts wanted to use the name because Roundup is so well known as a strong herbicide. So, the question is: Will it soon also be available in the US and elsewhere? How well does it work? One problem - it is unknown from what I am reading whether other "more toxic" ingredients (the secret "inert" ingredients) are also in the product. Here is a link to the product's page at the Austrian store Hornbach and at Amazon (above photo is of Roundup AC). By the way, vinegar works great as a weed-killer, especially on young weeds. Ordinary vinegar contains 5% acetic acid, but products with higher amounts of acetic acid (from 8% to 20%) are available (sometimes called horticultural vinegar) . But note that acetic acid products stronger than 10% can be dangerous if used carelessly - can cause burns if get some on bare skin or spilled on a person (it is acid, after all), so gloves and eye goggles should be used when using the stronger acetic acid products. To use ordinary vinegar as a weed-killer: Use on a hot sunny dry day. Just spray or pour some on the offending weeds - and whatever the vinegar touches will soon die. Unfortunately the weeds may come back after a week or two (the root systems may not be killed off) - so just reapply vinegar. Or can make the effects of the vinegar stronger by adding one cup salt to a gallon vinegar or a little (a teaspoon or more) dish detergent to the vinegar. Or combine all three ingredients when needing permanent removal of vegetation from an area such as sidewalk cracks or gravel driveways. From The Ecologist: Monsanto's new 'glyphosate-free' Roundup is vinegar! A new type of Roundup is on sale in Austrian garden centres. It's the same old bottle with the same familiar brand name and is marketed by Scotts, under licence from Monsanto. 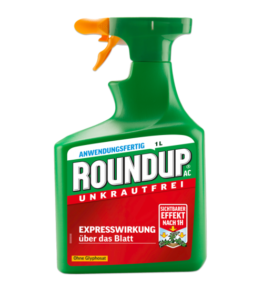 The only difference compared with the old-style Roundup is that the new one has a prominent label on the front saying it's formulated "without glyphosate" ("ohne Glyphosat" in German). On the back, on the ingredients label, the 'active substance' is defined as none other than vinegar: 'Essigsäure'. Monsanto's new 'Glyphosate-free' Roundup product, and a bottle of vinegar. Photo: Dr Helmut Burtscher (a biochemist/ GMWatch). In fact, organic and other gardeners have long been using vinegar as a weedkiller, which works by sucking moisture out of plants' leaves. It's most effective if used in dry weather when plants are already water-stressed, and the vinegar won't get washed off or diluted by rain. Most recipes also advise adding soap or washing up liquid to help it spread over leaves. Why does Dr. Burtscher [biochemist who bought this product at an Austrian garden center] think that Scotts brought out this product? "The World Health Organisations' cancer agency IARC has stated that glyphosate was a probable human carcinogen. Monsanto has admitted in court that it cannot claim that Roundup doesn't cause cancer because the complete formulation has never been tested. "Garden centres are wondering what they can tell their customers. They have undoubtedly lost business. Some have phased out all chemical pesticides, such as Bellaflora, which took this step in cooperation with GLOBAL 2000 long before IARC came out with its verdict.....Now they only sell organic-approved plant protection products." But why does Burtscher think Scotts are calling its new vinegar-based herbicide Roundup? "Maybe Scotts thought: We need this trade name because people see Roundup as more effective than vinegar!" Burtscher spent about €30 on the glyphosate-free Roundup but says in future he will just buy vinegar if it works out cheaper. It may also be safer, he adds, since "We do not know if the vinegar-based Roundup formulation still contains toxic adjuvants." ('Adjuvants' are additives present in glyphosate herbicide formulations that are designed to increase the toxicity of glyphosate to plants, for example by 'fixing' them to leaves and reduce wash-off in rain. But they can also increase the toxicity to animals, as in the case of tallowamine often used with glyphosate.) But if Scotts can prove the safety of the adjuvants, Burtscher says it's a win-win situation:"It's a victory for Monsanto because now it has a product that doesn't cause harm and a victory for people and the environment." Next article:Popular Weedkiller Found In Pregnant Women – What Are the Effects On Babies?